The anticipation of Mother’s Day was slowly putting my husband over the edge. How the man ever buys a satisfactory gift for me with all that intense pressure, I will never know. On Saturday morning I chuckled inside as he begrudgingly announced that he had some business to tend to and would be home shortly. As he dragged himself out the door, I hollered out, for the twentieth time that week, my short list of things that he could buy for me. I try to help him out like that. That’s what mothers are supposed to do and I wouldn’t want to shirk my responsibility so close to the holiday, would I? Less than ten minutes later, he walked in with a good size box under arm. It was all wrapped up. What in the world? He confessed; he had gone to work to pick up the gift that he had really purchased several weeks back. He had been acting worried for two weeks just to increase the surprise. I gasped for air. Had he really bought me a gift two weeks in advance? I must be getting more special by the minute. Or was I just better looking when I was 8 months pregnant with number three? He never buys Christmas gifts until Christmas Eve; he learned quickly to put off the torture as long as possible. Wow. I couldn’t have been more speechless if I had won the Grammy for mothering. I was in a trance. I sat and I unwrapped. I felt like the luckiest mother alive. And let’s keep this between me and you, I was taking my time because I was a bit worried about what he may have picked out all on his own. Ideas were flowing freely into my skeptical brain. What if it was horrid? How would I play it off? The worry lasted for just a second. The picture on the box stole away all of my spousal anxiety and mistrust. My jaw dropped. If the box was correct, he had purchased my coveted Kitchen Aid mixer. I can’t even tell you how many times it was on the long list of gifts to buy! It was the gift at the bottom for another day when we had more funding. It was a gift of such magnitude that it was never on the list that I typically yelled to him while he stomped out the door. How could he have remembered? When I started to tear up, it was a little more emotion than he was ready for. He quickly explained, “I hope this gift lasts you for the next three years because you probably won’t be getting anything else for a while.” We would all become law school orphans soon enough. The gift couldn’t have been any more phenomenal. Except maybe if it was a new couch. That is still on the long list. I tore into the box; I couldn’t wait to make some homemade rolls; I would finally be free of the torturous duty of kneading. I made a vow, the man would never hear me complain again. But, wait! What color is that? It’s not the same as the picture on the box? It’s not the plain old white model. Oh my goodness. Oh my goodness. My eyes did not deceive me. My man had given me the moon and the stars just as promised in those old fairytales. My new mixer was a mixer with a purpose; it made a statement as grand as mine. I am sure that LG has given me great Mother’s Day gifts over the last ten years, but I can’t for the life of me, think of one. How could he top perfection? And not because it was from the long list, but because it was red. He had chosen my favorite color. And it was beautiful. And if his 8 month pregnant wife wasn’t beautiful, you could have never convinced her of it. Her husband had reached perfection in the gift giving department. And he did it just for her. Now honey, don’t be getting any crazy ideas. A red couch would simply not do the trick for my upcoming birthday. Please keep the couch at the bottom of the long list and don’t EVER try to pick me out a couch, o.k.? Really, I want a say in the couch department. I am serious. Oh, and I love you. And, I love red. And, I love my red mixer. But, I won’t love a red couch. Got that? I will be submitting this to Scribbit’s September Write Away Contest. Just for fun. And as my way of saying thanks for the topic. Red Couch, don’t come to my house then 😉Great story!!! Good thing you set things straight or with all that emotion he might have picked up a red couch 🙂 How sweet–they have no idea how many points they can score with a move like that do they? What a sweet story! I love that you got the perfect gift and that it still makes you happy.Ps I have a red couch too and love it! 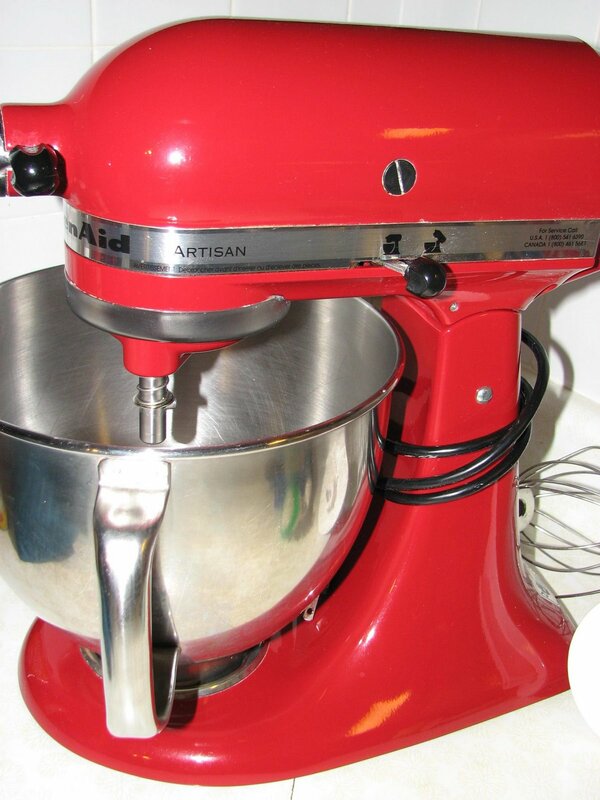 I want a red mixer too. I also want red plates and glasses too. the kind that are at walmart. Tell Albert. Red is my favorite color. I love the red mixer!!! And I would totally get a red couch! My couch is tan and it makes me sick, just like my puke colored curtains. My kitchen-Aid is so beloved by me. We do a lot together, she and I. Congrats on your gift (sorry so late). Great job on your writing. I’m always tempted to submit one, but even more scared. love love it! my mom sent me $300, i told her what I was going to buy. and she told me not to buy it, it would be my birthday gift! I asked for a RED kitchenaide TOO! !WE will be twins. I am so happy for you but bummed that I have to wait for dec.
I’ve got one in white( not daring at all)but love it! I use it all the time. I have the red one too! I got it for a Christmas present. The colored ones are so much better than the plain old white ones You need to get some attachments to go along with it. Come over to my house and I’ll show you how to make pasta! My husband recently gave me a gift that said, “I know you better than you think I know you.” And I was moved, just like you, to tears because he was right. Thanks for the reminder.And if I ever get my Kitchen Aid mixer, maybe I’ll go for the red too!